Bovine TB has been found in badgers in Cumbria for the first time in about 30 years, investigators have confirmed. The Animal and Plant Health Agency (APHA) made the discovery in the Shap area while investigating 16 cases of the disease in cattle in east Cumbria. The first cattle case was in 2014 but it has only now been found in badgers. The Department for Environment Food and Rural Affairs (Defra) said cattle movement restrictions are in place and further investigations are under way. A spokeswoman said: "Further action will depend on the results of further surveillance. "Farmers in the area should continue to practice good bio-security to minimise the risk of disease spreading to their farms." 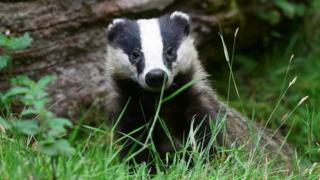 The spokeswoman said the disease was last found in badgers in the area in the 1980s. Chris Swift, a vet from Penrith, said it may be necessary to cull badgers in the region. He said the disease could have spread from the cattle into the wildlife who would then pass it back to even more cattle. He told BBC Cumbria: "The reason badgers are implicated are two fold; one is that the badger numbers have increased enormously in the past couple of decades and also badgers live in the same fields as cattle, they can move into cattle buildings and eat the feed and poo in the troughs. "It's very easy for badgers to spread the disease to cattle. "Every vet's dream is to have a healthy cattle population and healthy wildlife population. "We don't want to see anything culled but in the interests of the wildlife and the cattle and the human health risk ultimately I think badger culling is going to be a necessity."